The Ron Paul 2008 Presidential Campaign was an experience like none other, as it united people from all backgrounds and beliefs in pursuit of restoring our freedoms. 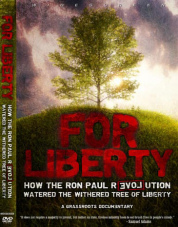 For Liberty: How the Ron Paul Revolution Watered the Withered Tree of Liberty documents this pivotal moment in our nation’s history- from the quiet murmurings of a possible Ron Paul presidential run in 2007, to the explosive movement that has since shaken the political and media establishment. Learn to what lengths individuals were willing to go to combat the disintegration of the Republic, as grassroots activists and patriotic heavyweights alike recount their experiences with the Tea Parties, the historic Moneybombs, and much more. For Liberty recaptures the emotional highs and lows of Ron Paul’s 2007-08 presidential campaign. This grassroots-produced documentary not only preserves a piece of American political history, but is guaranteed to encourage future generations of freedom fighters.